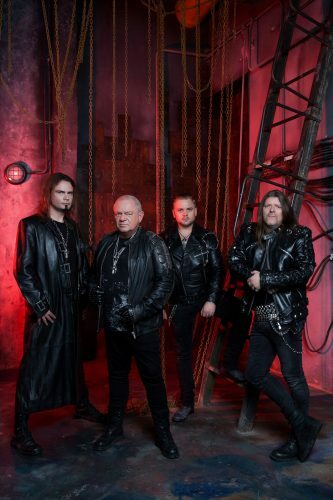 Udo Dirkschneider, the original singer of Accept, is the living embodiment of 80s Germanic metal. Along with Chris Boltendahl and Gravedigger1, he’s kept that dated sound alive long past its expiration date, releasing album after album of Accept-esque anthems with his eponymous band U.D.O., always light on sophistication but heavy on raspy screeching and classic metal tropes. Steelfactory is the 15th such platter of Teutonic splatter and shows nary an ounce of progression or innovation, sticking to that Accept B-side ethos that’s served the man so well since 1980. For the listener that means 58 minutes of simplistic, meaty riffing and basic metal songwriting topped off with Udo’s “feral cat by the tail” vocal stylings. That generally leads to a collection of good, bad and ugly tunes, and if you’ve heard any of his solo material then you know exactly what to expect. You won’t find less here, nor will you find more. The depth of your love for 80s metal will determine how that proposition works for you. First the good. “In the Heat of the Night” (no, not a cover version of the Sandra hit) is moody and surprisingly catchy, elevated further by some sweet Flamenco guitar-work. It’s classic Accept fare and wins on nostalgia as well as memorability. “Raise the Game” is a super rudimentary stomper with minor bells and whistles in the guitar department, but it’s Udo that sells it with aggressive snarling that shouldn’t be coming from a man of his advanced age. Both “Rising High” and “Make the Move” sound like lost cuts off Metal Heart and feature some nifty solo-work, and “Rose in the Desert” is like a sullen goth rock tune slightly metallized with a chorus that may be the album’s finest moment. Of special note is closing ballad “The Way,” which is a touching reflection on the man’s decades in the metal world, containing what sounds like the resigned realization he’s getting too old for it. At times here his voice sounds like a beaten down, aged Johnny Cash, which certainly adds to the impact. The song isn’t some instant classic, but for someone who followed Udo’s career since the early 80s, it certainly has emotional impact. The bad is reflected in “Hungry and Angry,” which comes across like a really bad Bon Scott era AC/DC cut with one of the most annoying and awkward choruses I’ve heard this year. “A Bite of Love” comes close though, with silly, cringe-inducing lyrics that make me reach for the skip button. 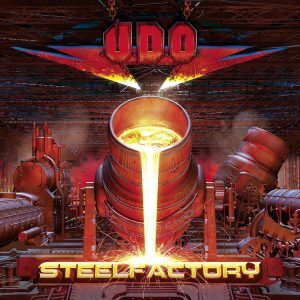 The remainder of Steelfactory sits in the good to ugly strata, managing to entertain but rarely rising above average for Udo’s body of work. Several songs do get elevated by flashy guitar-work from Andrey Smirnov, like “Blood on Fire” with its Russian musical influence, and “Eraser” which is a stock U.D.O. cut made more palatable with wicked soloing. The biggest knock against Steelfactory is the length. 58 minutes of U.D.O. is about 13 minutes too much, especially with average to sub-par material on offer. Take the best 8 cuts, street the rest and you have a zippy little rocker. Padding does no one any favors. Udo’s vocals have somehow remained largely unchanged over the years. He doesn’t go for those upper-register screeches anymore, but that raspy bite and snarl is still there and instantly recognizable. Only here and there can you tell age is starting to take its toll, usually when he tries to actually sing. Like Ozzy, he’s made a long career out of distinctive, but limited vocals and his place as a legendary metal frontman is all but assured. That said, the real star of the show for my money is Andrey Smirnov, who does whatever he can to make rote, by-the-numbers tunes feel vibrant and fresh. The man can play and his flash and sizzle on the fret-board injects some youthful energy, which is all that holds some of these moldy oldies together. Ultimately, Steelfactory is nonessential but it has some fun, rocking tracks. Udo seems content to keep retreading his Accept days ad nauseum, but every album has worthwhile moments, as does this one. The man may be getting older, but he can still much panther. Horns and hails for keeping his balls to the wall throughout a metal life well lived. Tagged with → 2.5 • 2018 • AC/DC • Accept • AFM Records • Aug18 • Decadent • German Metal • Heavy Metal • Review • Reviews • Steelfactory • U.D.O.